Sentences using phrase “supposed to” are generally said in Marathi as if saying “want to”. Such sentences are discussed in this lesson. However sometime you can find that sentences with “supposed to” are said little differently. Sentence structure is similar to sentence with “to want”; only difference is in form of subject. As highlighted below. The form of आयचा (AyachA) is created based on Gender and multiplicity of object; similar to what we have seen in Adjectives. For अकर्मक verbs i.e. verbs which do not need noun, the for of आयचा (AyachA) will always be neuter singular i.e. आयचे (Ayache). Here noun is bottle which is feminine singular. So form of आयचा (AyachA) is आयची (AyachI). Changing the subject will not change rest of the sentence as depends on object. In past tense only form of verb will change. For अकर्मक verbs form is always आयचे (Ayache). Such sentence formation can be used when you are urging someone affectionately. This time we could not meet, but next time we are supposed to meet for sure. 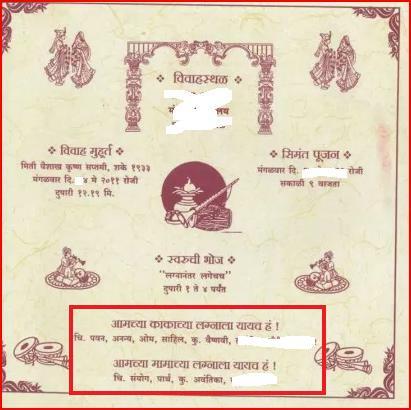 The popular use of this form is found on wedding invitation card. Where you find youngsters of family urging the invitee to attend the function. Such sentence formation can be used when you are forcing or threatening someone.